Gives new daedric text to over 80 scrolls! No more WOE UPON YOU when you're trying to heal yourself! 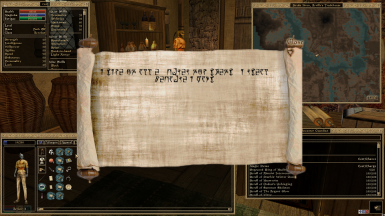 Over 80 scrolls in Morrowind either had WOE UPON YOU or shared the same text as other scrolls. For people like me who learned Daedric manually by reading signs and comparing symbols to messages, it was disappointing to see that most scrolls pretty much said the exact same thing. This mod fixes that. WanderingDeadeye reminded me of the problem so I rewrote a lot of text. I ignored about two scrolls in Bloodmoon because the Construction Set likes to be bad and crash. Did you know the only scroll Tribunal adds is a quest item? So there you go. New Daedric text to translate and enjoy. Some written from the perspective of their supposed makers, some having different styles in writing, some being a joke. That means you get a lot of violent, frothing mouth threats while also getting some humor. Don't worry, no references or memes or edginess. Just good clean dunmer scrolls.